The official release of the infamous 1988 film THE SOUND OF PROGRESS. This DVD has been completely remastered / authored from the original master film stock. 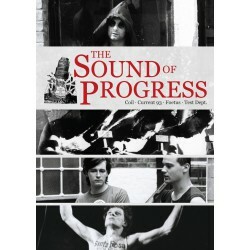 The documentary shows the mindset of the some of the most original and influential artists of the experimental scene. An unprecedented insight into the workings, the methods and the ideas that made these names legendary. Filmed in Hamburg, Amsterdam and London. COIL – CURRENT 93 – FOETUS – TEST DEPT. Interviews – live material – studio work – opinion. 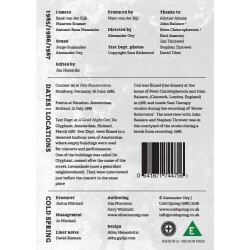 DVD case with 6 panel booklet containing liner notes by David Keenan. The DVD also includes a gallery of never before seen pictures of each band. PAL Region 0 / Region Free. Current 93 at Neu Konserwatiw, Hamburg, Germany, 16 June, 1985. Foetus at Paradiso, Amsterdam, Holland, 21 July, 1985. Test Dept at A Good Night Out, De Olyphant, Amsterdam, Holland, March 1987. Test Dept. were filmed in a deserted harbour area of Amsterdam where empty buildings were used for concerts and performances. One of the buildings was called De Olyphant, named after the name of the street, Levantkade (now a gentrified neighbourhood). They were interviewed just before the concert in the same place. Coil was filmed (the dinner) at the home of Peter Christopherson and John Balance (Chiswick, London, England) in 1986, and inside Sam Therapy studios during the recording of 'Horse Rotorvator'. The interview with John Balance and Stephen Thrower was in the courtyard of the studio during a break from recording, 1986. Includes 6-panel folded insert with notes and images.